Is Macy’s Post-Earnings Dip a Buying Opportunity? The retailer’s turnaround remains intact. Shares of Macy's (NYSE:M) plunged 16% on August 15 after the retailer posted its second quarter earnings. That massive decline was surprising, since Macy's top and bottom line results beat Wall Street's expectations. Macy's revenue fell 1% year over year to $5.57 billion, which beat estimates by $20 million but marked the company's first quarterly sales decline in three quarters. Adjusted net earnings rose 52% to $0.70 per share, beating estimates by $0.19, but that figure was significantly inflated by real estate sales. Excluding real estate gains, adjusted EPS rose 59% to $0.59. Let's dig deeper into Macy's second quarter report to see why the stock tumbled, and whether or not investors should consider buying the stock after its post-earnings dip. Macy's reported that comparable store sales for its owned departments remained flat year over year last quarter. However, on an owned-plus-licensed basis, its comps rose 0.5%. Those numbers weren't great, but they represent improvements from the prior-year quarter. Comparable store sales growth. Data source: Macy's quarterly reports. Chart by author. Macy's comp sales growth decelerated in the second quarter, but the deceleration was caused by a 53-week calendar in fiscal 2017. The calendar shift resulted in some promotions being shifted into the first quarter of 2018, which inflated that quarter's comps at the expense of the second quarter. Excluding that impact, Macy's first quarter owned-plus-licensed comps would have risen only 1.7%, while its second quarter comp sales growth would have accelerated to 2.9%. This indicates that Macy's overall comparable store sales growth remains healthy. Macy's attributed its growth to the strong performance of its three core chains -- Macy's, Bloomingdale's, and Bluemercury -- as well as the expansion of its Backstage off-price stores. The only sore spot was its mattress business, which faced tougher competition from online retailers. Macy's also expects the expansion of its mobile ecosystem, which is tied to its loyalty program, to boost its total mobile sales past $1 billion this year. Macy's slightly reduced its inventory year over year, and its gross margin rose 80 basis points year over year to 40.4%. 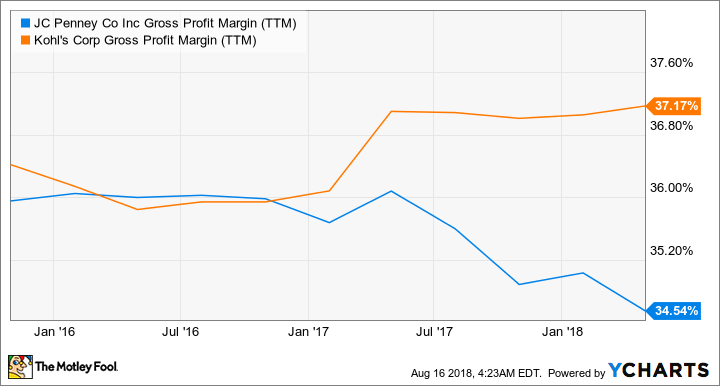 That's a much higher gross margin that what peers like J.C. Penney (NYSE:JCP) and Kohl's (NYSE:KSS) have achieved recently. J.C. Penney and Kohl's Gross Margin, data by YCharts. Macy's also hiked its guidance across the board. It boosted its full-year comp sales guidance (including licensed departments) from 1%-2% growth to 2.1%-2.5% growth. For the second half of fiscal 2018, it expects comp sales growth of 2.0% to 2.5%. Macy's has a rosier outlook for its business than some of its industry peers. For example, Kohl's expects 0% to 2% comp sales growth this year, while J.C. Penney expects flat comp sales. Macy's now anticipates flat to 0.7% total sales growth for the full year, compared to its prior forecast for a 1% decline to 0.5% growth. It also expects its adjusted EPS to grow 5% to 10%, compared to its prior forecast for a 0.5% decline to 5% growth. So why did investors head for the exits? Macy's report looks solid, but investors likely sold the stock for two reasons. First, the stock has already doubled over the past 12 months, so investors could simply be taking profits in a wobbly market. Second, CFO Paula Price stated that although gross margin would be "slightly up for the year," it could be "slightly below" the prior-year performance in the third quarter. Price noted that higher delivery expenses from Macy's growing digital business would exacerbate this pressure. At around $36, Macy's stock trades at just nine times this year's earnings, and its dividend yields 4.2%. That low multiple and high yield should limit its downside potential, and the company's improving fundamentals should eventually win back investors. The concerns about margin compression seem overblown, and they merely indicate that Macy's is ramping up its digital and delivery efforts to keep up with the times. Therefore, I think Macy's is a solid buy after its post-earnings dip.